We supply a range of OCIMF compliant ancillary equipment which have been specially designed and selected for marine hose applications. 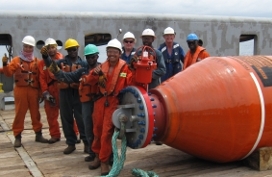 Allied Marine Logistics Limited, founded in 2008, provides independent specialist marine hose engineering support services to offshore terminal operators around the world. We support marine terminal operators seeking to optimise the use of marine hose assets by focusing on safety, the environment and the availability of the marine terminal. We offer support services to operators of all brands of marine hose. We believe an impartial view, independent of the manufacturer, is invaluable as it is not influenced by the incentive of future marine hose demand. While our work requires that we maintain a co-operative professional relationship with marine hose manufacturers, SPM system designers and marine services providers; we take great care to guard against any conflict of interest to preserve our independence. Registered In England and Wales. Company No. 6566677. © Copyright Allied Marine Logistics Limited 2008 - 2019. All rights reserved.